The Catamount Trail Association (CTA) was founded in 1984 by a group of avid cross country skiers with a vision of a cross country ski trail, analogous to Vermont’s famed hikers’ Long Trail, that would stretch from the Massachusetts border all the way to Canada and offer adventurers the ability to ski the length of Vermont. The original team of three skiers who set out in pursuit of this vision on their historic 1984 trek were hosted during their journey at Camel’s Hump Nordic Ski Center, then owned and operated by Dave Brautigam and Myra Handy. 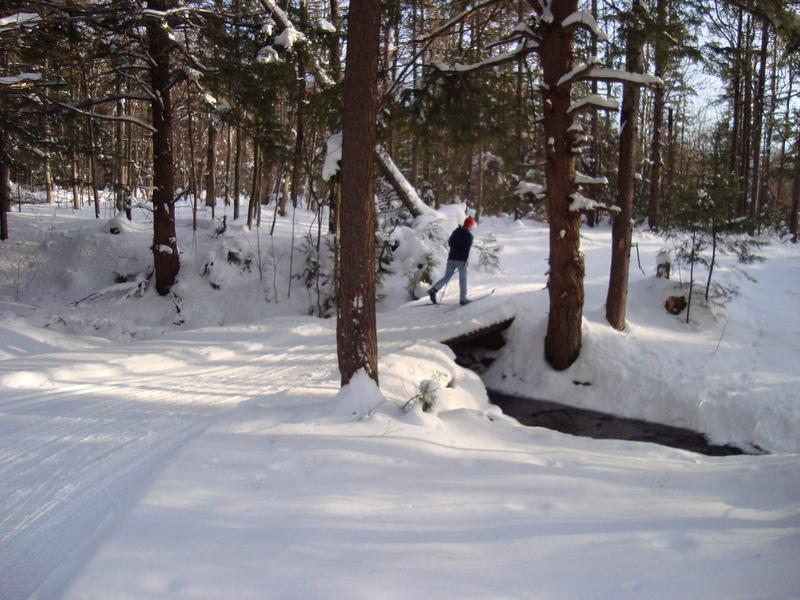 Brautigam became a founding board member of the CTA, and the Catamount Trail is now an integral part of the Camel’s Hump Nordic xc ski trail network. To learn more about how that exciting vision became a reality and to explore CT trail options for yourself, visit the CTA website. The Camel’s Hump Challenge is, as its name suggests, a challenging backcountry ski of 25km that takes the skier all the way around the perimeter of this fabled mountain at elevations ranging from 2500’ to 3500’. The “Around the Hump” event was conceived in the mid-1980’s as a fundraiser for the Crohns and Colitis Foundation and later the Vermont Alzheimers Association, by the late Dr. Warren Beeken, a pioneering backcountry skier from nearby Richmond. After cutting well-traveled ski trails on Mt. Mansfield, from Underhill to Stowe, Warren turned his focus on Camel’s Hump and spent many days departing from a base at Camel’s Hump Nordic as he scouted and cut the trail now appreciated by so many Camel’s Hump Challenge skiers. Check out their photo gallery and learn more at the Challenge's website. CHNSA is located in the mountain town of Huntington, which is at once, both the most rural town in Chittenden County and a scant twenty-five minutes from the University of Vermont in Burlington and Lake Champlain. Huntington is not a typical resort town like Stowe, Killington, or Stratton, but skiers from outside the area can take advantage of three truly unique lodging options located right on the CHNSA trail network. Windekind Farm offers three cottages located in an idyllic setting within the ski trail network that have to be seen to be appreciated. They are all handcrafted works of art, created by the owners of the farm, Mark and Marijke Smith, who are long-time neighbors, friends and collaborators in the evolution of CHNSA. There is yet another exquisite lodging option at Fielder Farm —an absolutely stunning, one-of-a-kind monitor barn residence, owned by fellow neighbors and skiers, Bert and Sarah Dickerson. Fielder Farm is located in pure solitude on the Catamount Trail just a 3km ski south of CHNSA at the road’s end, where it overlooks a lovely pond and the Camel’s Hump foothills. Finally, check out Air B&B for listings in our area. There are quite a few! Sharing in the grandeur of the Camel’s Hump foothills from the west side of the Huntington River valley in Huntington, is our neighbor, Sleepy Hollow, a well-known and acclaimed, year-round xc ski and mountain biking center. After an inauspicious 1979 start-up by the original owners, Sleepy Hollow has been brought spectacularly back to life by the Dave and Sandy Enman family. Dave and Sandy's children,Molly and Eli—who trained at CHNSA while skiing for their local high school and later distinguished themselves as All American xc ski racers at Middlebury College—are carrying on the family enterprise. Sleepy Hollow is known for its lovely wedding facilities, including their Round Barn—inspired by the historic, landmark Round Church in Richmond—in addition to the inn, ski and biking trails.